19. 29/8/2018. Trampers. 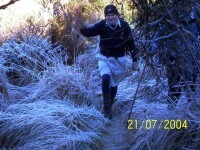 Steve Amies / Little Coal Tracks. M. Leader: Arthur. 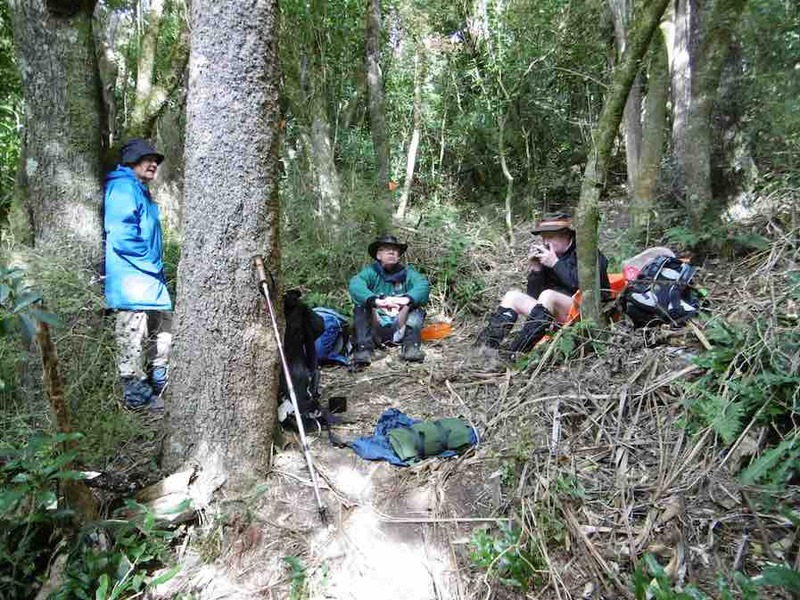 7 very keen Trampers did a bush circuit in the Silverstream Valley. Parking at the Pump-house we followed the track past the swing bridge, then up to Tunnel Track to take us to McRaes Weir and the shortcut up to Steve Amies, down Little Coal Creek Track, and returned on Racemans. 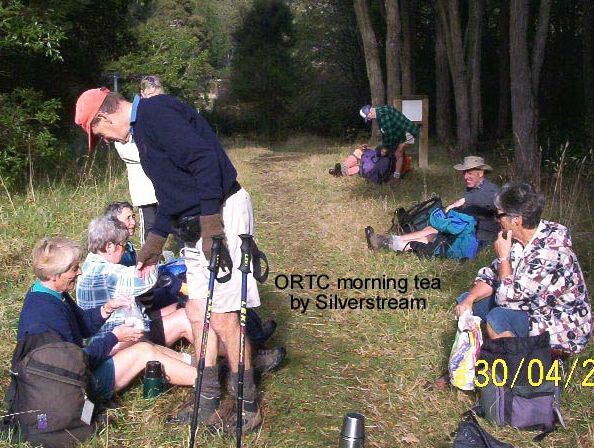 Morning tea was taken a partway along Tunnel Track, above a large slip, where there is a good view across to The Chalkies. 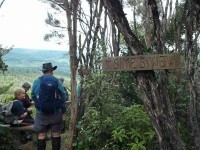 The shortcut track up to Steve Amies is a bit of a grunt, but taking our time we easily overcame it. 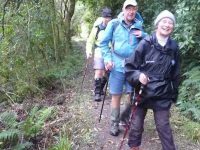 The day had shown promise before we started, but the cloud was low down on all the surrounding hills and high up on the Steve Amies Track the rain started. 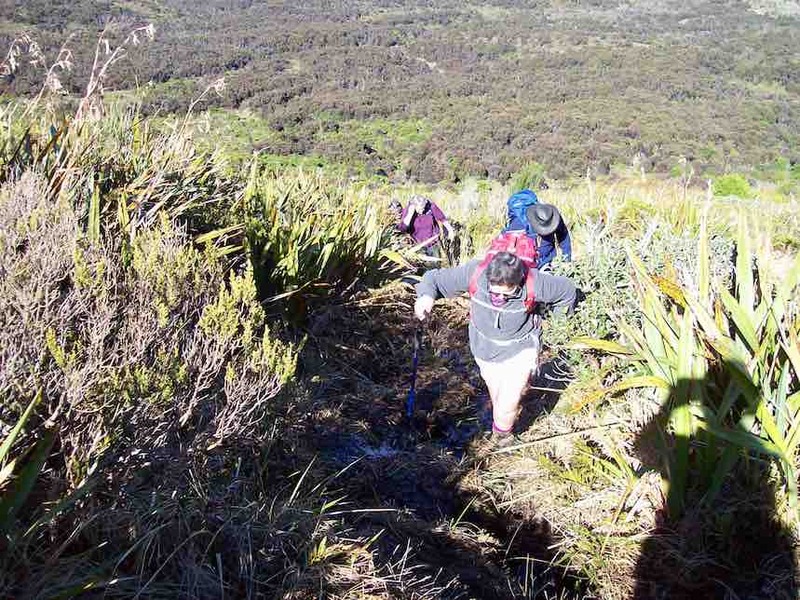 On reaching the top, at Trig Q, we immediately started down the Little Coal Creek Track. 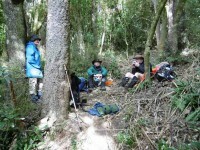 We stopped to have our lunch in the first relatively sheltered place in the bush. 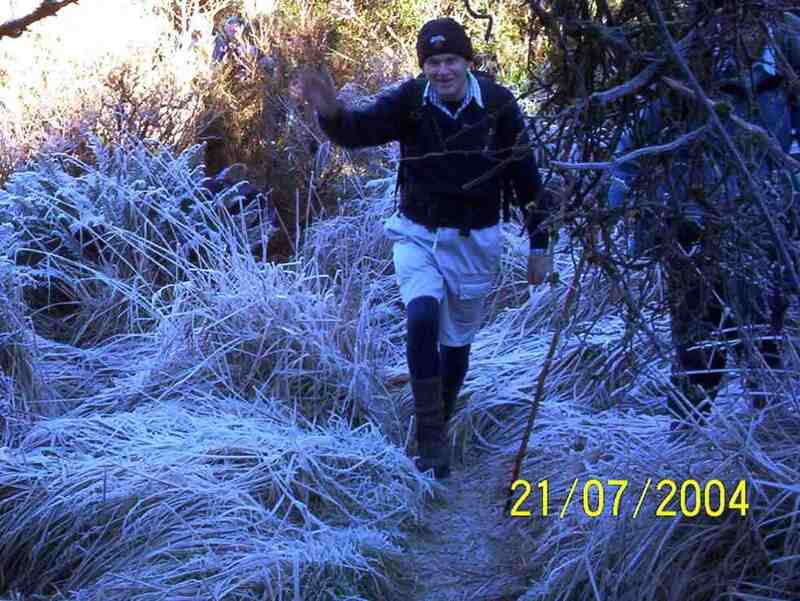 It was colder, so we didn’t stop long before following the track on down. 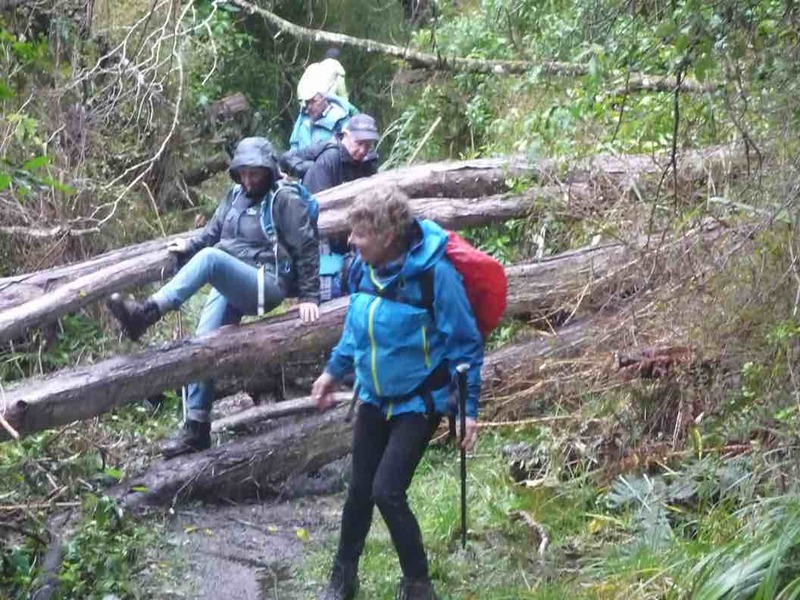 The lower half, especially, of the Little Coal Creek Track is steep in places and was slippery and rather treacherous from the rain that had just fallen. … tree hugging, and even the rolly-polly method. Afterwards I was assured that all had thoroughly enjoyed (?) the experience – which seemed strange to me. The last leg of our trip was simple in comparison, along the Racemans Track. 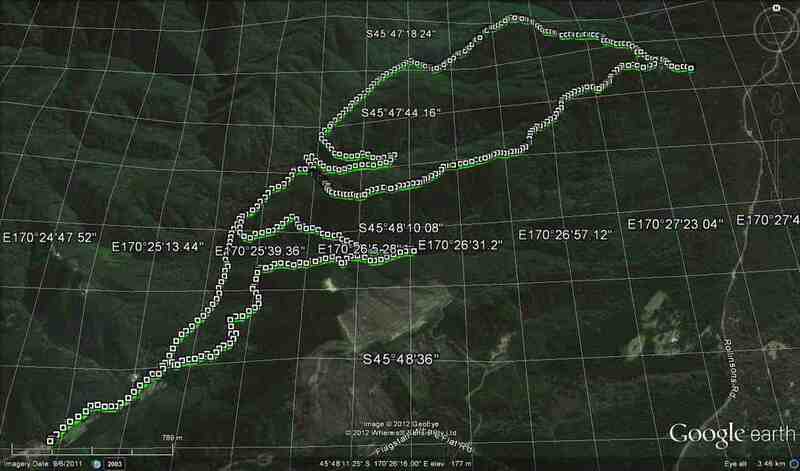 We were back in the cars around 3.15 pm, and I have it on good authority that we had walked 15 km. 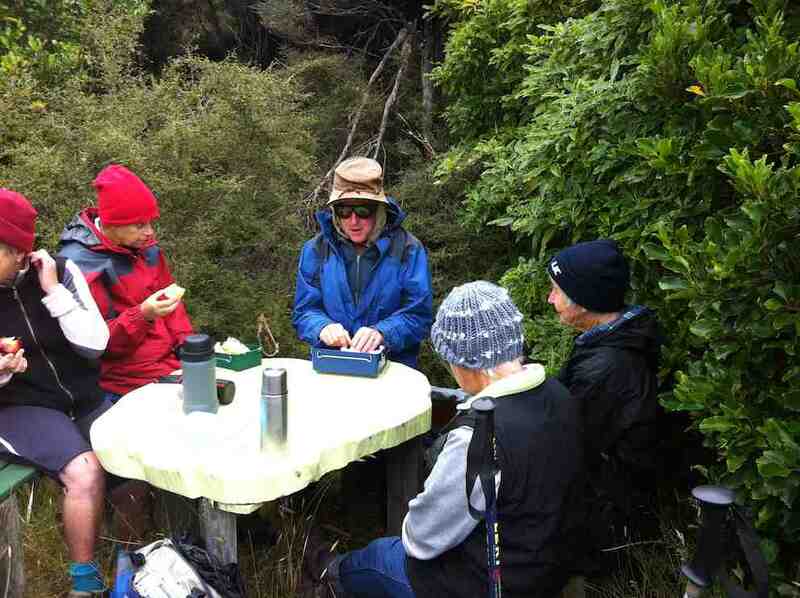 The rain had eased off later, and conditions were pleasant other than being cold at lunch time. The leader awards a Gold Star to each of the party for their contribution to a great day’s tramping. Upon returning to Mosgiel it was decided it would be inappropriate to visit any coffee shop, due to travel stain. – Art. 18. 14/9/2016. 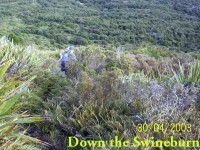 Swine Spur – Rollinsons Road – Steve Amies – Tunnels Track. M. Car Shuttle. Leader: Arthur H.
A clear sky, brilliant sunshine, and only a light breeze – perfect. 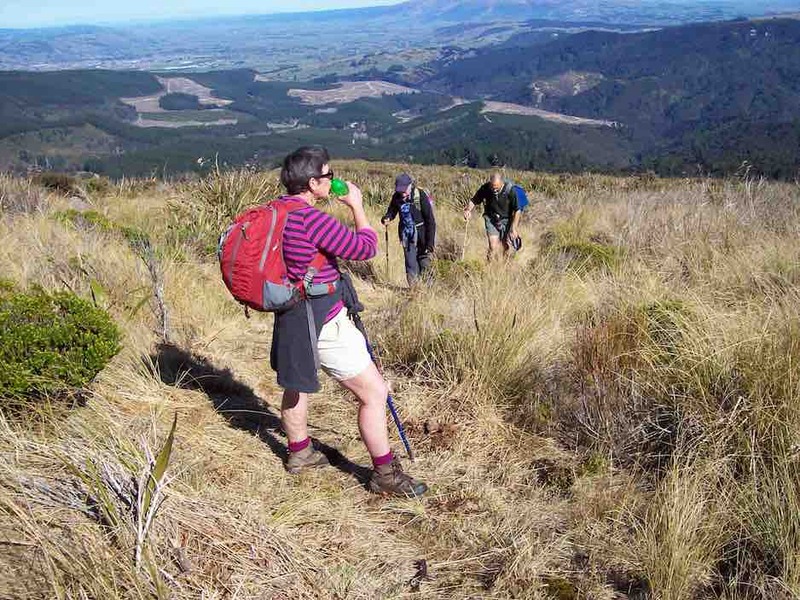 After setting up a car shuttle for later, 6 enthusiastic trampers began the day’s operations from Rollinsons Road, to walk up the full length of the Swine Spur track. Further up we met 4 trampers and a dog coming down – and soon found that it was the same group that had had morning tea with us a week ago on the Tunnel Track. Pleasantries were exchanged. 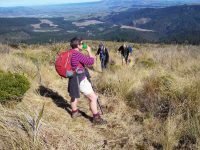 … and we topped out at 10.45 a.m.
After a brief pause to enjoy the view, we walked the road, passing the VOR aviation beacon on the highest point of Swampy, going down now. 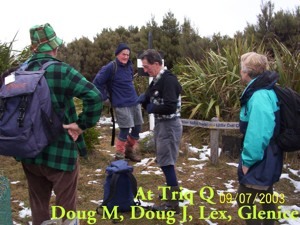 After 50 minutes on the road we were on the track, heading in to Trig Q. On the way past, we stopped to check out the picnic area before heading down the Steve Amies Track. With perfect timing we stopped at Bryan Freeman’s Memorial Seat to enjoy our lunch. A very pleasant spot with the sun filtering through onto us. 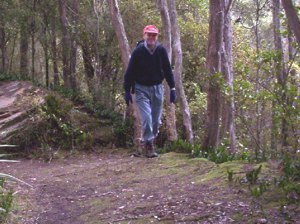 Note – Bryan Freeman was a keen tramper who died here on the Steve Amies Track in 2011. He was the son of Jim Freeman, who is remembered by the track named after him. 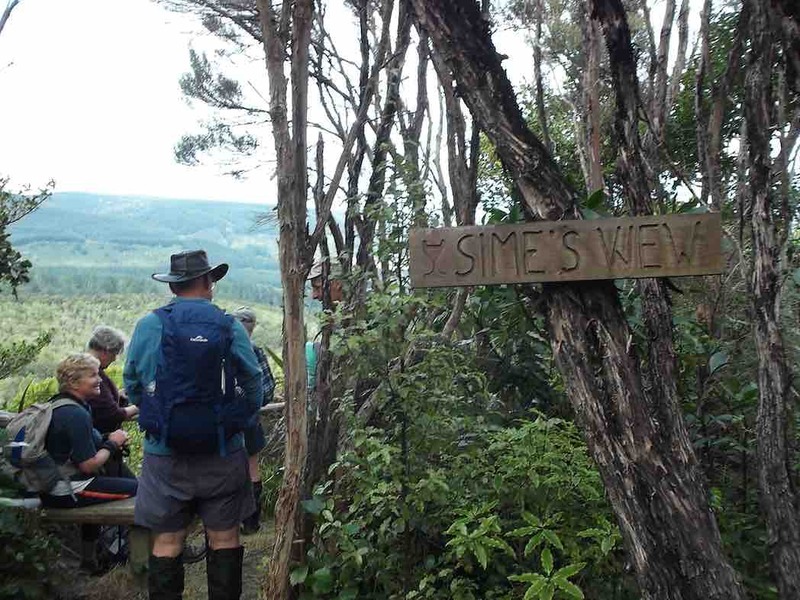 We continued down the Steve Amies Track until turning off to the left onto the short steep track that took us down to McRaes Weir and “the rope”. From there we followed the Tunnel Track, which in turn follows the contour. Easy track but very enjoyable. No-one showed any enthusiasm to enter the tunnels, but we did admire them in passing. 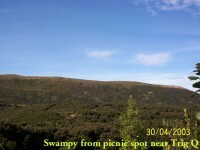 We reached our tramps’ end at the road at 2.15 p.m. My car was nearby and it soon re-united Neil M. with his one at our starting point. And so, back to Mosgiel. The good weather, together with the variety encountered during the tramp had made for an enjoyable day. The distance tramped was around 11 km (at a very rough guesstimate). – Arthur. 17. 14/10/2015. 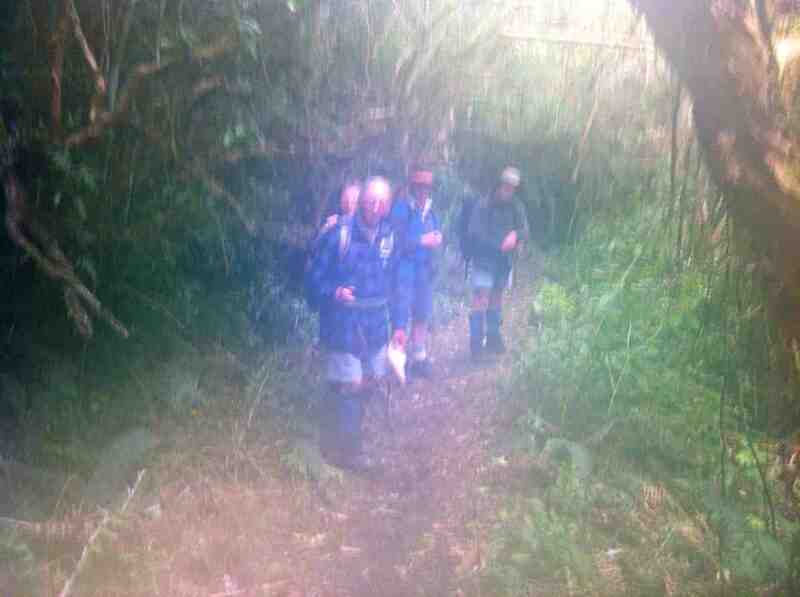 Trampers. Little Coal and Steve Amies. This was an uneventful trip, with no problems encounted. The weather was great, cloudy conditions with very little breeze. 16. 15/10/2014. Trampers. 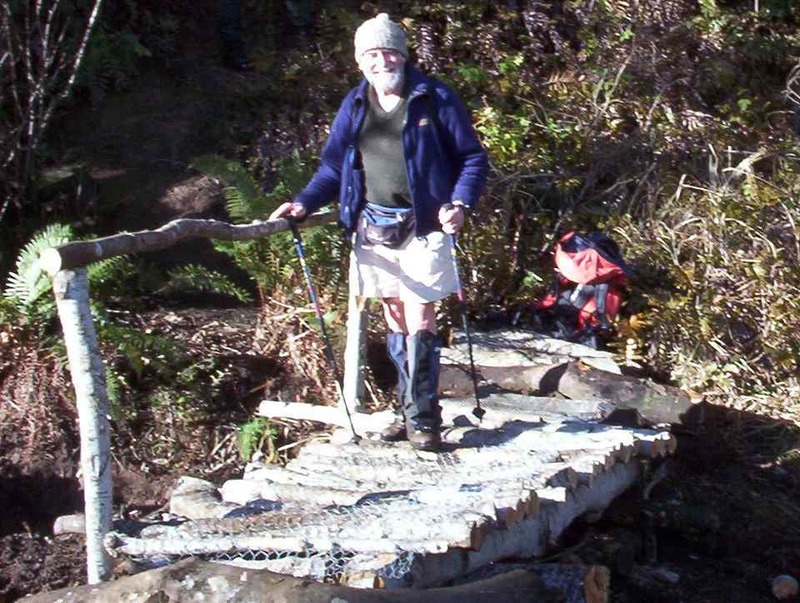 Little Coal Creek, Steve Amies. H.
Little Coal Creek, steep in places, can be slippery. 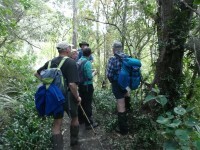 4 of us set off from the Pump House up Silverstream Valley, onto the Racemans Track. Calm weather. Had morning tea at a sunny spot at the junction of Little Coal Creek track. Took off one layer of clothing. On the ascent, stopped a few times to take in the views. Had lunch at Trig Q. 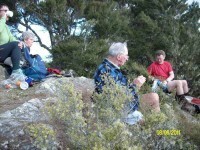 The weather was so calm the bushes were not moving at all at 505m. 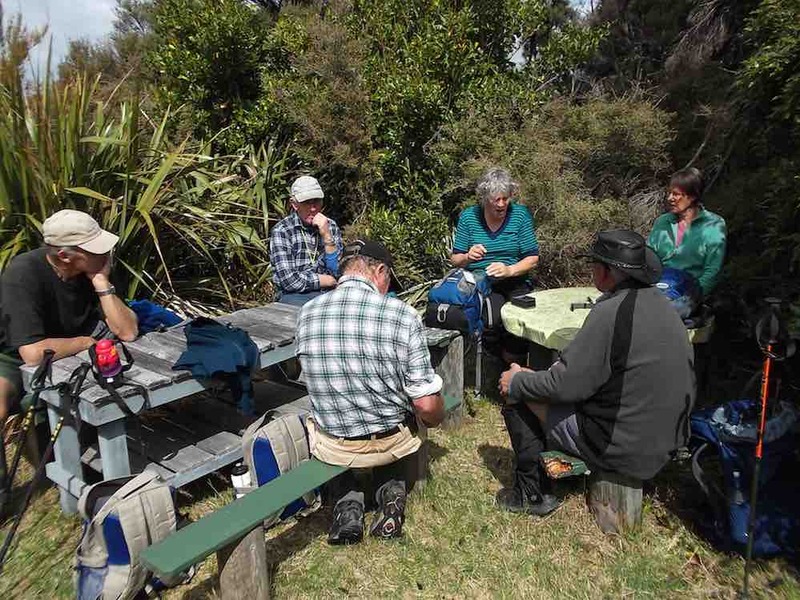 After lunch, we went down Steve Amies track, stopping to take in the views north, south and west and listening to the birds, – the noises of them! Back along Racemans Track to the car. Tramp enjoyed. The biggest comment on the trip was ‘How calm’. – Heb. 15. 29/7/2015 Trampers. Little Coal, North Coal. 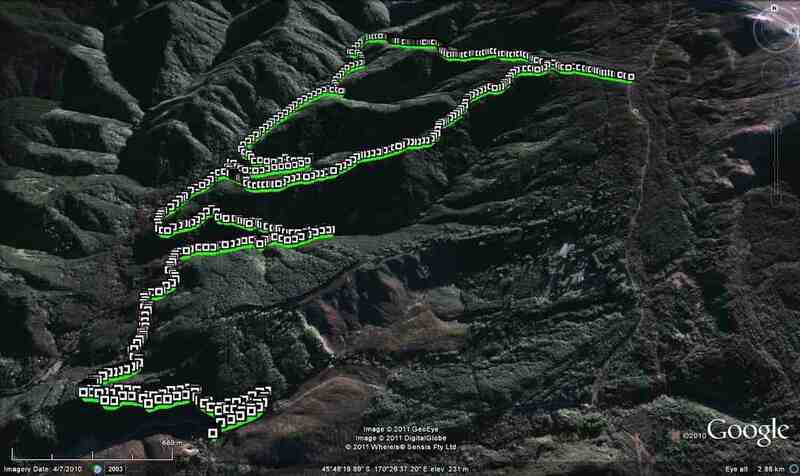 GPS map of route, courtesy Ken. Racemans Little Coal North Coal McRaes Weir Tracks. 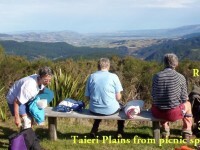 Walked 14.5 km; 4.3 km/h ave; 3h 23m moving; climbed 460mtrs. 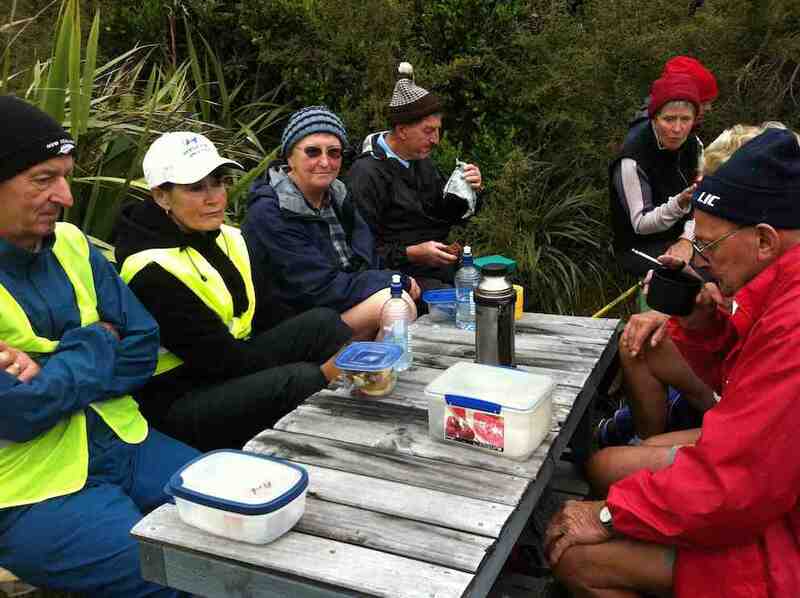 Today was a hurried change of tramp, as when I got up to the Bullring for the start of our tramp, it was foggy, blowing, & VERY cold, so I made the decision to cancel this, & meet at the start of Silverstream Rd. Where we decided what we would do for the day. We then made our way to the pump house car park at Whare Flat, & set off along Racemans track. 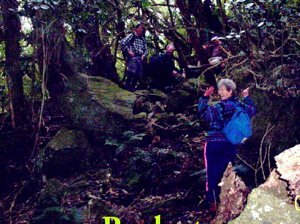 When we reached Little Coal Creek track we decided to go up there, & come back down North Coal Creek, if the tracks were suitable. The ground was surprisingly dry, so we had no hesitation about carrying on. 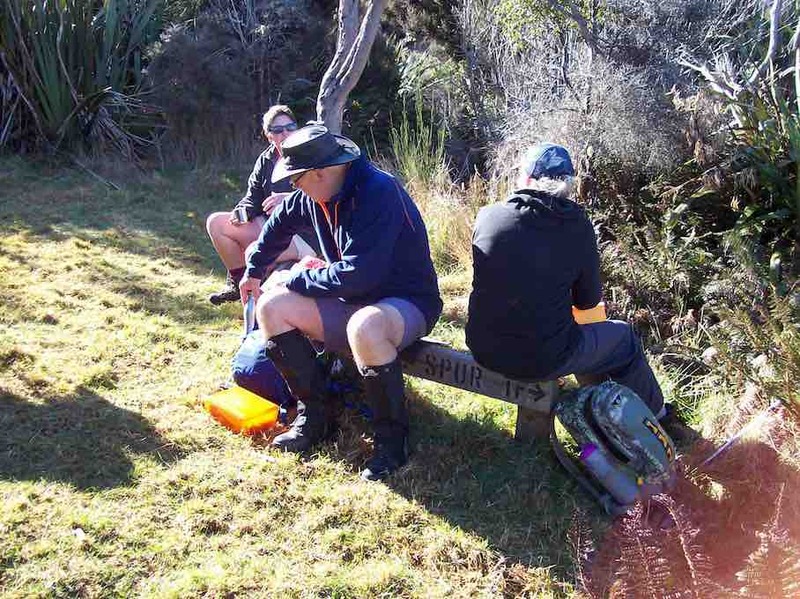 After struggling up Little Coal, with numerous stops to regain our composure, we arrived at the junction with North Coal track, so we went down there a short distance out of the breeze to have lunch. 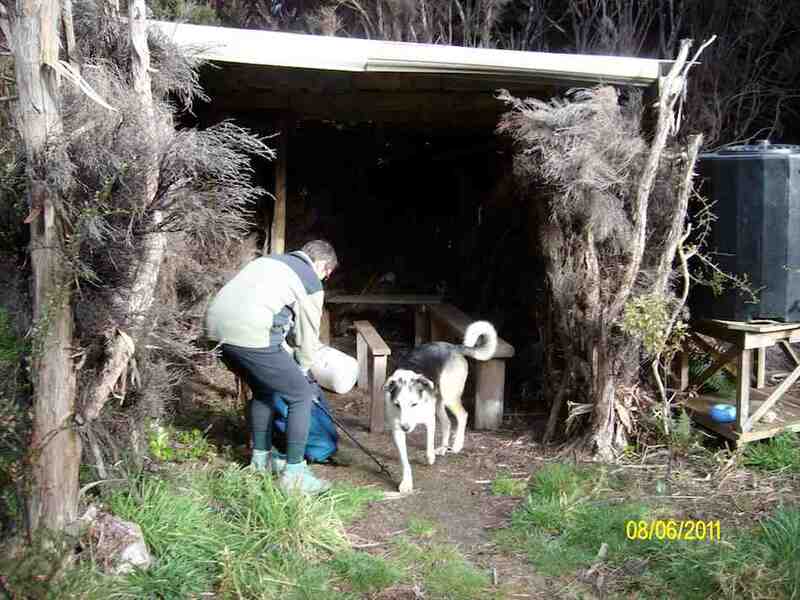 We were all looking forward to descending North Coal, as last time we did it, Finn, Dermot’s dog was the one who led us in the correct direction, as the track was in very bad condition due to storm damage, & was non existent in parts. 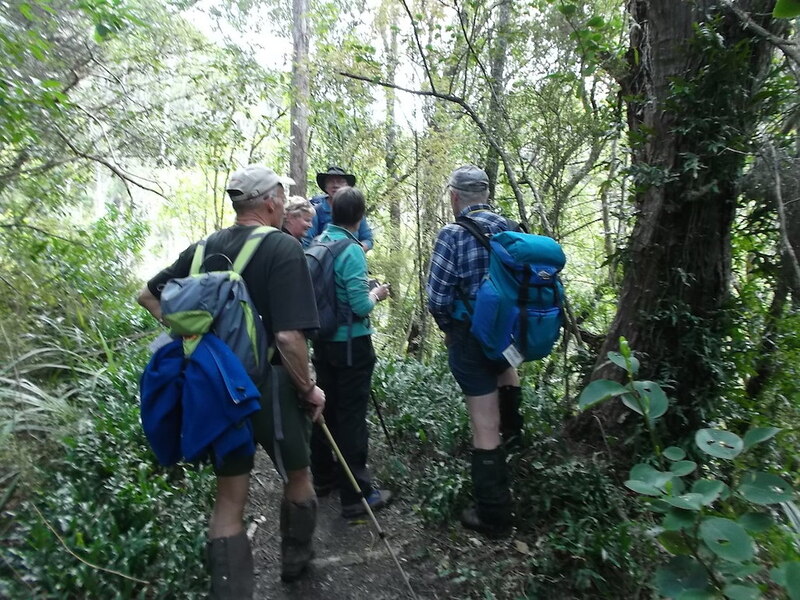 However, the Green Hut Track group have been through there & reopened it, & put in some more markers, so it is very easy to follow, but quite difficult travelling. 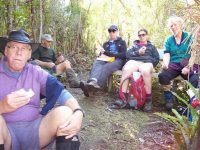 On the way back we went around the McRaes Weir track to lengthen our journey a bit, & walked down the unmarked track that comes out beside the picnic table down near the Silverstream. We stopped here for another cuppa before we walked out to the cars. There were no incidents today , apart from me slipping off the edge of Little Coal track at one point, & managing to arrest my slid with the aid of a handy tree. No damage apart from pride !! The day had a few light showers, but didn’t require wet weather gear, however it paid to keep moving, as the temperature was quite cool with the small amount of breeze. 14. 1/2/2012 Both. Steve Amies from Access Road. Leaders: Arthur and Barbara. 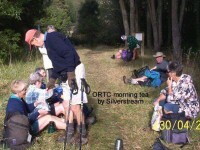 Sixteen of us left our cars at the locked gate on Rollinson access Rd and made our way up to the Track Clearers’ Picnic area. 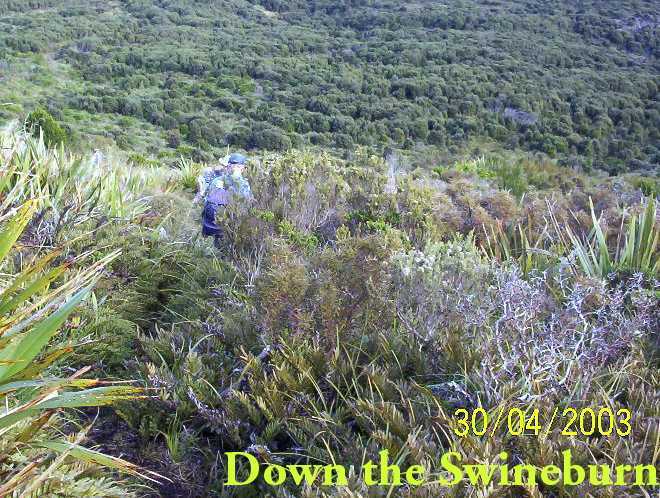 The leaders took us round many of the little nooks and crannies (they just seem to multiply of their own accord), stopping to inspect the labels fronting each bush planting. Of poignant note in front of one bush was a label printed with the name of Les Murcott, whose funeral a number of us had attended only a fortnight earlier. We stopped off for our tea break. 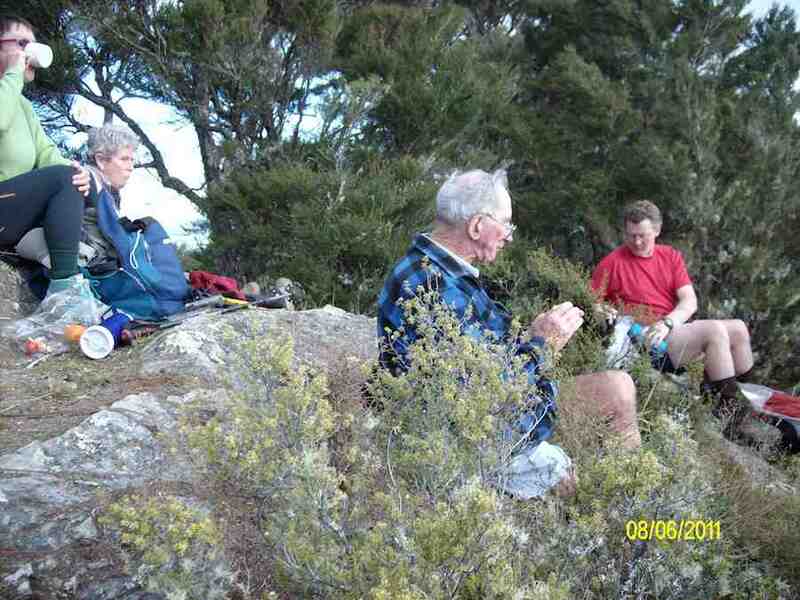 Arthur led us down and across to Trig Q, and then on down Little Coal Creek until we got to the look-out. 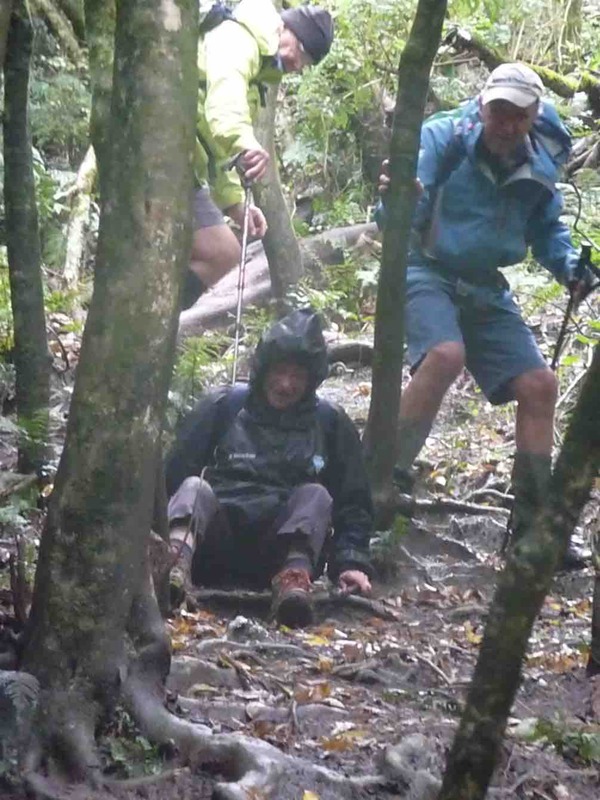 We careful negotiated some quite steep parts of the track and avoided any casualties. Then came the more arduous climb back up to the trig and across to the Steve Amies. 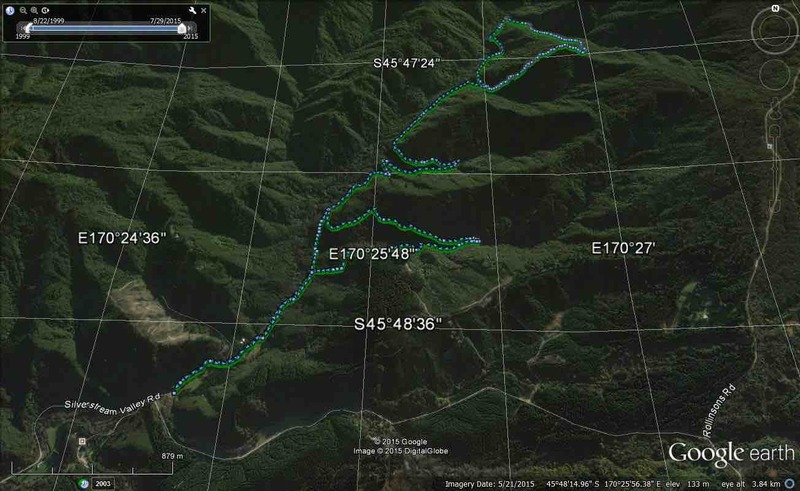 This latter track had a much more moderate decline (we stuck to only its upper reaches! ), past another look-out, before making another turn around further down, to wander back up to the trig and on to the picnic area for lunch. Back up at the picnic area, our leaders discovered for us yet another alcove with ample tables and seats for a comfortable lunch. 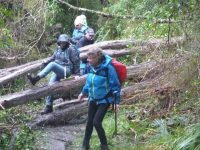 Our leaders took us out to the road by a route different from the one we had entered by, and lo and behold, a salubrious shelter, doubtless erected by the track clearers for their comfort. Bravo. Then we had only a stroll back down Rollinson Road to the cars. 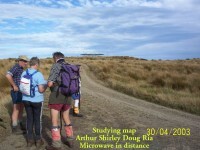 A leisurely 5.5 km walk, (as measured by two with their measuring devices.) Thank you, Barbara and Arthur for your careful leadership. – Ian. 13. 17/10/2012. Trampers. Pumphouse, Racemans, Steve Amies, Little Coal Creek, Racemans, McRaes, Pumphouse. 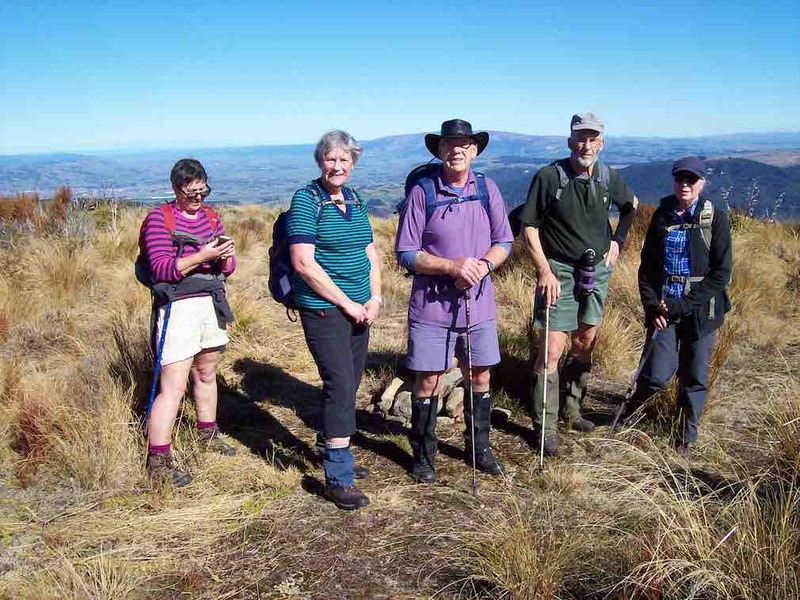 Five of us had a great day doing the two ridges. The Steve Amies was as steep a struggle as ever at its foot. The easier bit at the top seemed much longer than the writer’s memory had shortened it. We had a leisurely lunch at the set of seats and tables a little beyond trig Q. Sunny and no wind. Great. Then back again and down to where Little Coal Creek branches off from North Coal. Again the first bit of climbing on Little Coal had escaped the writer’s memory. 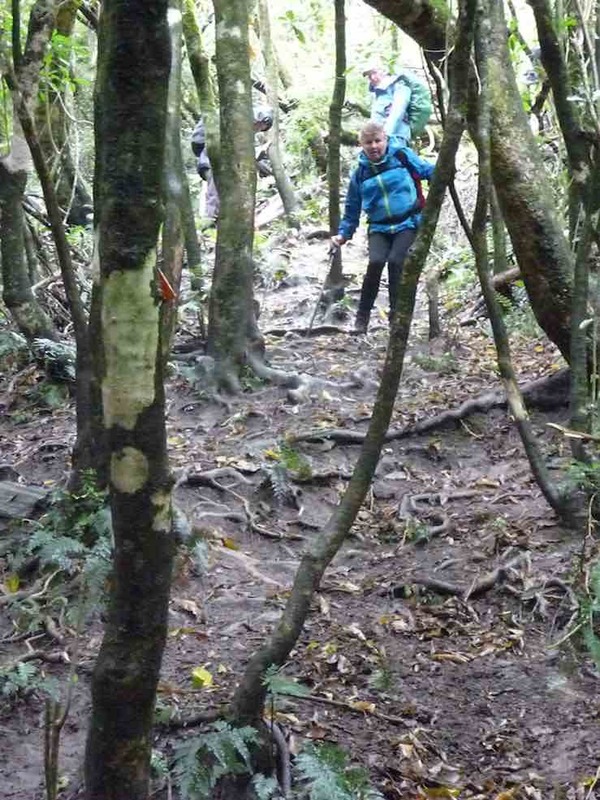 The steep ridge descent needed careful negotiating. One of the party was heard vowing it was a track they would never wish to ascend. Then it was off the ridge and down the side. 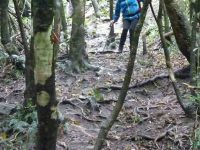 The ground is so heavily littered with twigs and leaves that it is almost impossible to keep one’s feet on the steep bits. Forgot to take photos! And the one below, taken back on the Racemans turned out mysteriously bad. Taken on the Racemans on the return journey. We elected to take the McRaes track back. 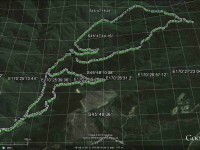 The GPS of the route brings out the depththat the gully takes the track into before emerging back out again. We stopped en route for a drink break as it had been a longer day. We made our way around until turning off at the junction with the Tunnels Track onto the connecting track that took us down to emerge by the swing bridge. A longer day – we got back out about 4 o’clock. Considerable height climbed and descended. A good work-out. And it was our good luck that the promised rain held off until we were back in the cars again. – Ian. 12. 8/6/2011. Trampers. Tunnels, North Coal, Steve Amies, ret. Medium. … & road, where we had another meeting about how we go back again. 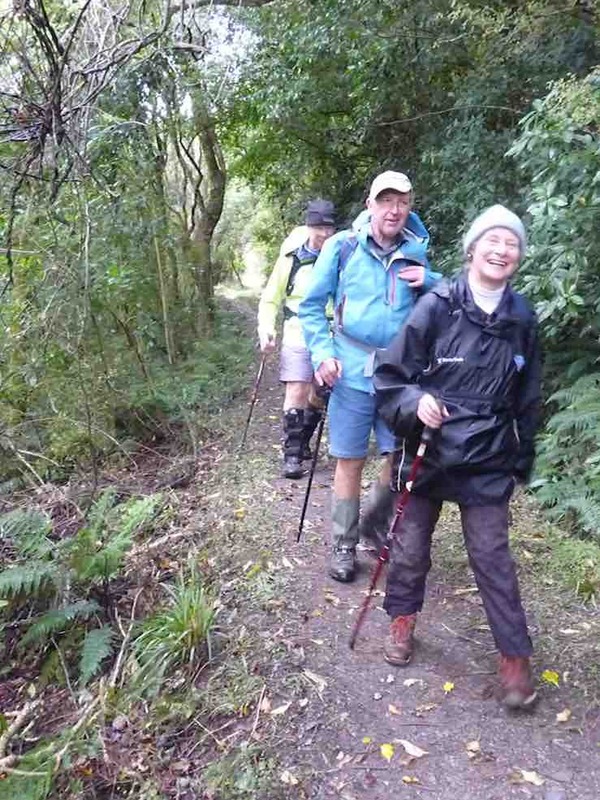 It was decided that we go down Steve Amies track, so off we went, with everybody starting to get a bit tired. 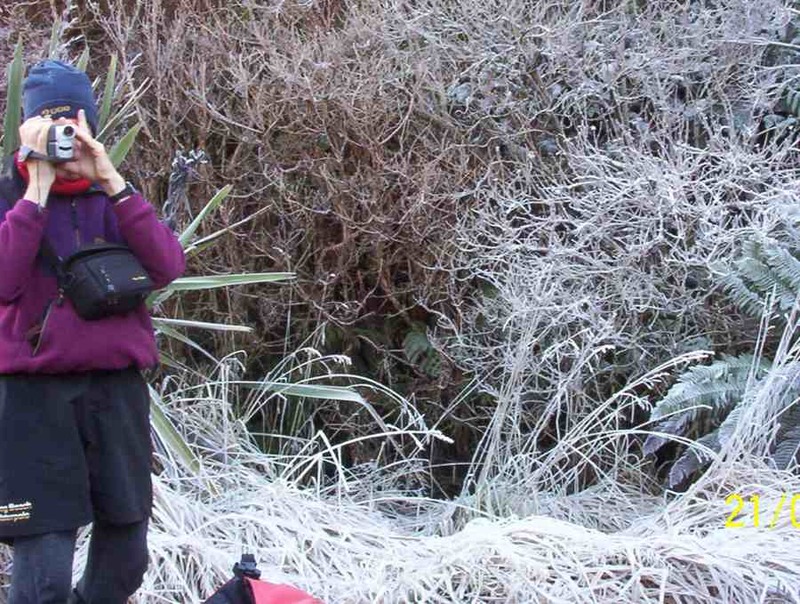 We arrived back at the cars at 5:00pm, having started at just before 10:00am. 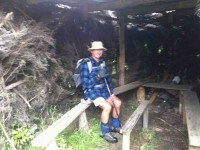 We walked [according to the GPS] 20.2 km, & did a total ascent of 578mtrs. Total moving time 5hrs 2min. moving ave. 4km/hr. overall ave 2.8km/hr. Stopped time 2hr 11min. So it was a big day for the 6 of us, but all enjoyed the walk. I think they will sleep well tonight !!! The girls enjoyed the picnic area etc at the top by the road, along with the view from the lunch spot, so quite a bit of time was spent around there, as they had not been there before. We started our descent at 2:30, so it took 2 1/2 hrs to walk back. Maybe better to do this tramp when we have a 9:00am start, as it was starting to get a bit dark by the time we got back. Also, we were not wasting any time while walking along the Racemans etc, much faster than we would normally be going. The trip could be shortened a bit by going in at the pumphouse, but how much that would cut off I don’t know.The day was fine & sunny, but cool & calm. The tracks were mainly dry, & only muddy in the normal Racemans track positions. The hill climbs/descents were quite good. Some parts of the tracks need a bit of clearing, but not too bad in general. – Ken. 10. 25/7/2007. Hikers. Access Road, Steve Amies. Leaders: Bob H, Graham. 7. 27/7/2005. Hikers. Steve Amies, Trig Q. Bob H, Les W, Mary M.
4. 9/7/2003. 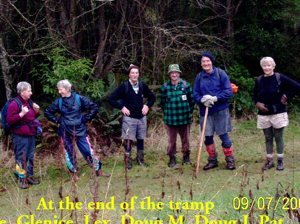 Trampers. Tunnels, McRaes, Steve Amies, North Coal Creek, Racemans.Medium. Leaders: Irene, Doug J. 2. 23/10/2002. 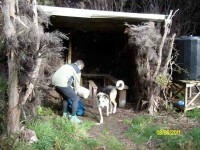 Tunnels – Steve Amies – Little Coal Creek – Racemans. Medium+. Leaders: Lex, Bob H, Wendy B.